Today’s interview is with a young entrepreneur and college student who has become a huge inspiration to me. S.A. Porcher is one of the creative minds behind Aviator Owl Books Inc., a company devoted to sparking imagination in children while also raising awareness of and contributing to charitable causes. S.A. Porcher and her partner, Chris Bill, have pledged to donate a portion of the proceeds of the sales of their picture books, eBooks, and other products to causes such as First Book and The Make-A-Wish Foundation. They are also dedicated to creating quality books for children that entertain and educate. I’m excited about Aviator Owl Books. I’m convinced it’s a rising star and I’m happy to share its story with you. Read on to learn more about S.A. Porcher and AO Books. Q. Can you tell me a bit about yourself and what inspired you to start Aviator Owl Books? S.P. Sure! I’m 24 years old, I love being outside and I love to learn new things. I was raised on a steady diet of imagination, curiosity and science, which is probably why it is rare for me to find a subject that I don’t enjoy (and also why I was always into trouble as a child – sorry Mom). I have always had ideas for stories randomly bubbling up in my head, but it wasn’t until college that I started to act on them. The original designs for Aviator Owl were born the summer before I left for Purdue University, and I never thought it would go further than digital images that I sold on a site called Zazzle. The five owls were created specifically to be sold on that site, and I had never really considered it more than a fun summer project. Only later was it recommended to me that I write a children’s book, and The Aviator Owls Learn Their ABCs was born in the fall of 2010. At the same time I was working on a side project called Write for the Cause – which was (then) completely separate from Aviator Owl. The first book was My Dragon Humphrey, which I wrote specifically with HALO Animal Rescue in mind. I got pretty serious about Write for the Cause, and had all but given up on Aviator Owl to focus on it. As luck would have it, I met Chris Bill in the fall of 2012, and after a lot of discussing and planning, we officially went into business together in October 2013. He loved the idea of writing books to promote causes, and with his background in Computer Graphics Technology, we Frankensteined all of our talents into one entity that we could both get behind. We decided to merge the Aviator Owl characters with the idea of writing books for causes. Through research we discovered that children today enjoy books in print and online, which ties into Chris’s background of CGT quite nicely. We also found that kids hate learning unless it’s done in a way where they have fun. Put simply: they like games. All of these put together and we came up with Aviator Owl Books Inc. So your question “What inspired me to start AO Books?” is tricky to answer. I wanted to help children learn, but both Chris and I also wanted to do something we love. I think what we came up with fits both. Q. What is the goal or mission of Aviator Owl Books? S.P. AO Books seeks to inspire and educate children through print books, eBooks, online games, and apps. (Or at least that is what we are hoping for in the future. Right now we only have print books and eBooks.) We want to help cultivate children’s imaginations, and also raise awareness of important causes. Right now we support HALO Animal Rescue, First Book, and the Make-A-Wish America, but we hope to show our support for many more in the future. Q. Who writes, illustrates, and publishes the books you sell? S.P. I do. I was born to make up stories, and I’ve been writing them down since I knew how. 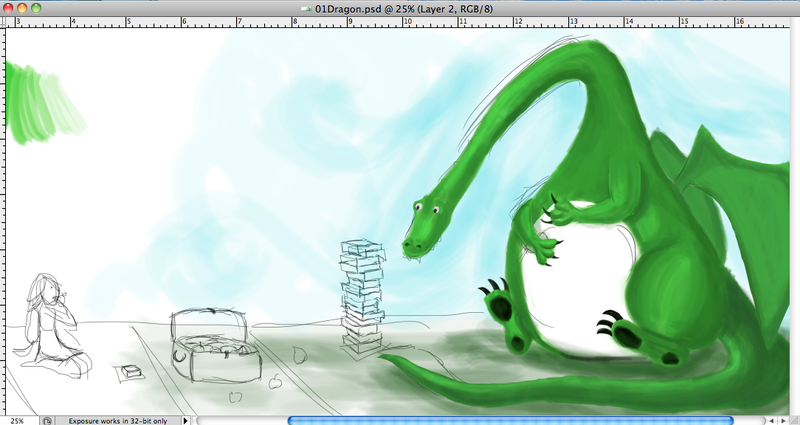 (Although when I was younger I also included illustrations that make no sense to anyone anymore.) I fell in love with drawing when I was in high school and taught myself Adobe Illustrator the summer before college. I love having the ability to come up with a story, write it, and illustrate it on my own because it gives me a freedom that I know a lot of other writers and illustrators are forced to give up. That being said, I do have story ideas that demand a certain type of illustrative style, and I’m not talented enough to fulfill exactly what I want. I am trying to teach myself, and I practice almost every day, but if the time comes to begin serious work on those stories and I don’t feel prepared to complete adequate illustrations, then I have no problem hiring a freelancer to help us out. As for the publisher: AO Books goes through Amazon’s CreateSpace. We purchase our own ISBNs and barcodes and put them on the covers and then upload all of our files onto our CreateSpace platform. Eventually we would love to publish our own books in-house, but that’s something that we’ll have to address as we grow. Q. How do you decide what charities to contribute to? S.P. All three of the charities we support now have come to us differently. We did research to find an organization that made sense for our ABC book, and First Book was a perfect fit. HALO Animal Rescue was chosen because Ellen DeGeneres mentions it on her show occasionally, and she’s a huge inspiration to me. The most recent charity we chose was the Make-A-Wish Foundation, and we chose that to go along with the book called The Boy Who Played With Stars (which was just launched). I came up with the idea for that book in a (dreadfully boring) English course. I was doodling stars and thinking that everyone should be able to do what they want to do in life, even if it seems crazy. A boy who literally goes into the sky to play with the stars is a bit far-fetched, but the idiom is very common. Shoot for the stars, and dream big. Chris and I have both known people who participate in Make-A-Wish, so it seemed like a no-brainer for that book. Of course, we also accept suggestions! Q. What books are currently available and how can they be purchased? S.P. All three books can be purchased at Amazon.com. Q. Do you have other items available for purchase as well? S.P. We currently offer free printable activities, which we upload to our website two times a week (Mondays and Thursdays). Those can be accessed here: http://blog.aviatorowl.com/activities/all/. We also have a very small Zazzle storefront. It used to be much larger but after our trademark was approved, we took everything down and slowly we are uploading new designs with the trademark. There you can purchase clothing, posters, iPhone cases, etc. Eventually we’d love to expand to stuffed animals and educational toys, but for now we’re more focused on the books and expanding those into interactive online pages, even if they are just seasonal. 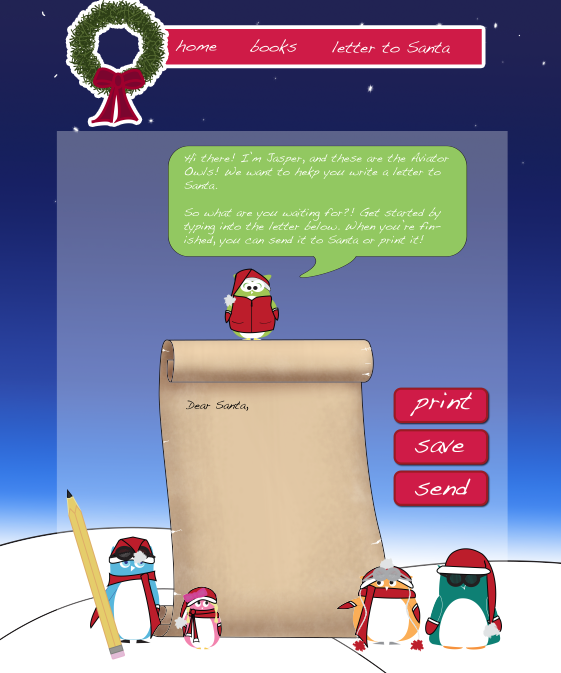 For example, this past Christmas we set up a site where kids could write a letter to Santa. A Christmas project at AO Books. Q. As a full-time student, how do you juggle your academic life and the responsibilities involved in running Aviator Owl Books? S.P. Very carefully, and sometimes not well! (There are a lot of sleepless nights involved.) My three majors are Industrial Design (aka Product Design), English, and Creative Writing, and my two minors are Entrepreneurship and Psychology. Every day at school I take classes that are directly applicable to AO Books, so that helps keep me motivated to learn new things, which in turn helps keep my grades up. On the flip side, AO Books benefits from what I learn. Of course, there is the occasional class that bores me to death and those are the classes in which you can find me at the very back doodling, drafting, editing, or anything else AO Books needs done. I often have people tell me that I’ve “bitten off more than I can chew”, or whatnot, but I think part of keeping everything from spinning into chaos is keeping the right perspective. I keep in mind that I’m very lucky to be in school, which is something some students take for granted. I know a lot of college students are notorious for procrastinating, but my version of procrastinating is working on Aviator Owl because that’s what I love. I love coming home to sketch and think about otherwise impossible things (like a boy who plays in the night sky). I know exactly what I want to do and really college is just teaching me how to do it. Q. Where can people go to find more information about Aviator Owl Books? S.P. Our main website can be found at blog.aviatorowl.com. At http://www.zazzle.com/aviatorowl we have some products (and we upload new designs as we create them). And of course people are free to email me at saporcher050@gmail.com, or the company at aviatorowl@gmail.com! Terrific and very inspiring interview! Congratulations and much success with Aviator Owl! Hi, Robin, Thanks for commenting! I am very inspired by Miss Porcher. She has done so much at her young age. I may even donate a portion of the sales of my future books to a good cause too!